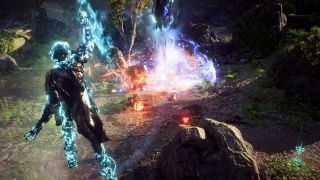 Anthem is getting a new patch which should be out next week, and Bioware has shared details of the extensive changes coming, which include neat boosts for PC players such as a FOV slider and DLSS support for those running Nvidia’s latest Turing graphics cards. According to information imparted by a developer livestream that took place yesterday, patch 1.04 is making some important changes, including removing the loading screen for the Forge (the presence of this, and other loading screens, being one of the biggest sources of irritation for players). Also with this patch, Elysian chests are being added to the game, to reward those who kill the boss at the end of strongholds. These can contain vanity items and crafting embers, and you get the key to the chest by completing a specific daily challenge (every player in the squad gets the rewards in an opened chest, incidentally). Loot has also been further tweaked with stronghold and freeplay chests getting improved drop rates for rarer gear. As mentioned at the outset, there are some smart visual changes on the PC, including the introduction of a FOV (Field of View) slider. This will give access to various different FOV settings, including a Ground FOV, Zoomed FOV, Pilot FOV, Flight FOV, and Swim FOV. Those who own an Nvidia RTX graphics card will be pleased to hear that DLSS support is coming to the game with patch 1.04, and various miscellaneous performance optimizations have been implemented, too. Finally, for those who want to exercise the power of multiple graphics cards, the developer also noted that: “SLI support is still being looked into.” For the full list of tweaks and changes, along with issues which are still being investigated, check out this post on Reddit.